With more features than you could shake a (selfie) stick at, this narcissistick turns out to be a handy all-round photography tool. It’s a monopod, stupid. As a genre it’s been laughed at and derided, but the selfie stick was around for a long time in Asia before the hordes (of mostly narcissistic Westerners) decided to get on its back. Before the marketing accident that was the selfie stick, products like the Cygnett GoStick were called monopods, and gained in popularity as modern smartphone cameras improved. But whatever you call them, there’s no getting around one fact; serious, professional photographers all have at least one selfie stick it in their camera bag. With products like the Cygnett GoStick, that’s not surprising, because despite its selfie stick moniker, this is actually a well-made, fully functional photography accessory that does way more than your average banned-from-museums selfie stick. While some monopods have Bluetooth modes, other use cables; this one, uniquely, provides a clip on Bluetooth remote. 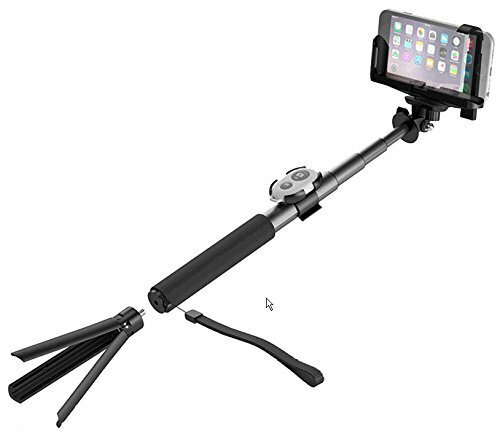 Easy to pair with from any smartphone – Android or iOS (though it has a separate shutter release button for each flavour) – it’s probably best left clipped on to the column of the Cygnett GoStick, but it does add tremendous versatility – principally because this product also comes with a tripod. If a removable Bluetooth remote is rare, a tripod is unheard of. It’s optional, and screws on the bottom of the selfie stick, creating a tripod for your smartphone. That in itself is an unusual thing to have in your travel gear portfolio. Unfortunately, the tripod is not stable enough, and there’s no left/right adjustment on the GoStick’s phone support, so it’s difficult to get a dead-on straight image. If you extend the GoStick fully, it loses a lot of stability when on the tripod. However, this is no disaster. Just the provision of a tripod thread on the bottom of the GoStick would have done since it means it can be used with any tripod you may already be travelling with. It’s just another reason why the GoStick will find its way into the camera bags of professional photographers pretty soon. Yes, the Cygnett GoStick is pretty good at goofy shots of your face, too. About 25 cm long when retracted, theGoStick reaches about 55 cm when fully extended, though there is a middle option of around 40 cm. It’s actually possible to lock the GoStick at any point in between, too, with just a twist of the neck to the right to lock it. Atop the GoStick is a spring-loaded phone holder that’s adjustable by height and width, though you do have to be careful not to block the phone’s rear camera (selfie fans needn’t bother with this step). GoPro cameras can also be attached, with a special, longer screw attachment provided to give a snugger fit on the existing holster. With more features than you could shake a (selfie) stick at, theGoStick impresses. Really all that’s lacking is a slightly meatier tripod and a left-to-right rocker in the otherwise impressive phone holster. Forget selfies; anyone after a decent support for a phone – perhaps for time-lapse or slo-mo photography, for video, or simply for taking photos from unusual angles – should pack the Cygnett GoStick. Just don’t tell those narcissistic naysayers.